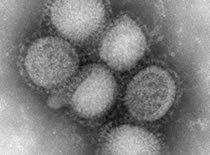 The H1N1 flu is believed to be waning in Mexico. Step by step businesses are slowly reopening and schools will be following suit shortly behind. In the US the virus is still spreading with new cases being reported everyday. As of early morning, May 5, 2009, there have been 403 lab confirmed cases across 38 states and one death in Texas. Although people seem to be tiring of the whole swine flu situation they’re still taking precautions. Americans are wearing respirators or face masks to protect themselves against H1N1 and using hand sanitizer and hand wipes like it’s nobody’s business. Not that you can see it on your hands but have you wondered what does swine flu actually look like? It doesn’t look too terribly scary but at the end of the day, the flu is the flu. No one wants it and if you do get it stay home and keep your germs to yourself. Regardless of whether or not H1N1 is here to stay or on its way out it’s always a good idea to keep hand sanitizer with you. Soap and water are not always accessible and no one wants to walk around with “I just filled the gas tank up” hands. How many people touched that gas handle before you? Were their hands clean? Do you believe America has hit its peak of H1N1 cases? Do you agree with schools being shut down so doorknobs, classrooms, bathrooms, etc. can be thoroughly disinfected? Are you toting hand sanitizer or sanitary wipes for those moments when your hands are feeling that not so clean feeling?